Each visit to the new Dale Chihuly installation at the Dallas Arboretum reveals more beauty than you thought was possible at one of the city’s greatest treasures. 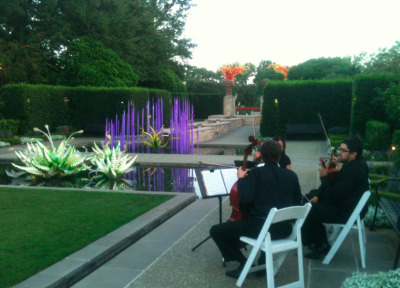 The Chihuly installation at the Dallas Arboretum opened with great fanfare, and some amazing garden parties recently. Fortunately the installation will stay until November 5th because you’ll want to plan for multiple visits so you can see the pieces in daylight, at sunset and after dark. Each setting completely changes the the scope of the show. The opening ceremony was held on a sparkling morning when Mayor Mike Rollins and other notables officially opened the Chihuly’s installation at the Dallas Arboretum. The artist and his wife, Leslie, spoke along with Arboretum Board Chairman, Brian Shivers, son of one-time Texas Governor Allan Shivers, Council woman Ann Margolin, Richard Holt, Texas President of Bank of America, and Holly Reed, Regional Vice President of AT&T (a hero of many causes across Texas}. It was an ideal Who’s Who from across the city. The 66-acre garden was pulsating with the praises of hundreds of attendees that couldn’t wait for the ceremonies, gasping at the other-worldly beauty of the glass sculptures juxtaposed within the lush greenery and gorgeous flowers. It was like standing on the vast set of a sci-fi epic film where no expense was spared to make the most odd-yet-familiar, spectacularly beautiful planet. Before the Saturday morning’s opening ceremony, I had the invitation to enjoy the private sponsor pre-opening with the key executives from Bank of America and AT&T. Sunset cocktails with the artist started the evening followed by a wonderful dinner shared with VIPs that included several top executives of the banking and communication giants, a few Metroplex mayors including Beth Van Duyn of Irving, and several state legislators. After the event was over, I stowed away with a top-sponsor for a wine-glass-in-hand, golf-cart moonlight tour (just four of us) chauffeured and narrated by Mary Brinegar, President and CEO of the Dallas Arboretum Board of Governors. What a way to end an amazing evening. Chihuly’s impressive body of work is included in more than 200 museum collections worldwide, including the Metropolitan Museum of Art, the Smithsonian American Art Museum, and the Corning Museum of Glass, to name a few. The intriguing garden sculptures of the legendary glass artist will be on display unti November 5th, so it is a must-see for everyone in the state. Chihuly’s dramatic sculptures and installations bring bold colors and imagination, beautifully executed throughout the vast garden grounds. 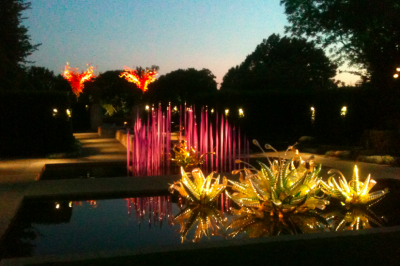 For more information, The Dallas Arboretum is open daily from 9am until 5pm and 6 – 10 pm on Tuesdays, Wednesdays and Thursdays by prepaid reservations for Chihuly and concert nights. For more information call 214.515.6500 or visit the Arboretum’s website at www.dallasarboretum.org.